In 1867, Central Park designer and architect Calvert Vaux (1824-1895) created an observation tower atop Vista Rock to overlook the old reservoir that is now the Great Lawn. The Gothic-style Castle was designed as a landmark for the pedestrian park visitor. The castle’s United States flag could be seen from the Mall, drawing the walkers down to Bethesda Terrace, over Bow Bridge, and through the Ramble to the castle itself. The original plans for the building included another elaborate two-story structure on the site of today’s pavilion, but financial concerns halted construction and left the castle in its present state. Portions of the castle are made from the same type of schist as the Vista Rock, creating the illusion of a castle rising out of the park itself. Its light colored stone trim is made of granite quarried from Quincy, Massachusetts. Its roofs are made of colored slate from Vermont, Virginia, and New York. In the early 1960s, the Weather Bureau replaced the lab with automated instruments and closed the castle offices. 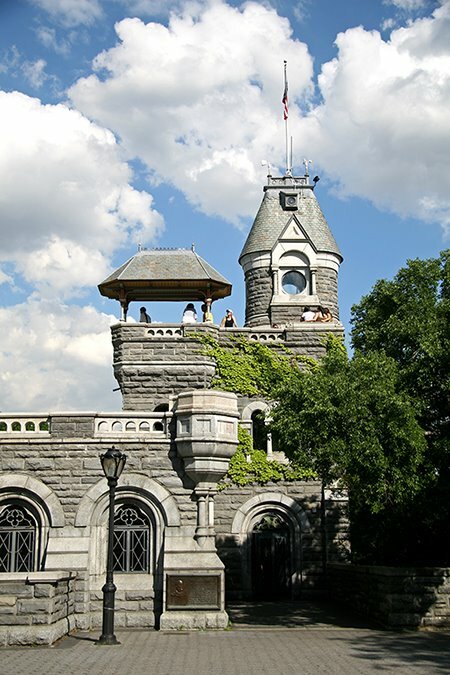 The empty building was left to deteriorate until 1983, when the Central Park Conservancy replaced the original turret, rebuilt the pavilions, and converted the castle into a visitor’s center. The Henry Luce Nature Observatory in the castle, created in 1996, provides interactive nature exhibits inside the castle as well as bird-watching kits, which can be used throughout the park. Note: Belvedere is an architectural term from the Italian ("beautiful view"), referring to any architectural structure sited to take advantage of such a view.